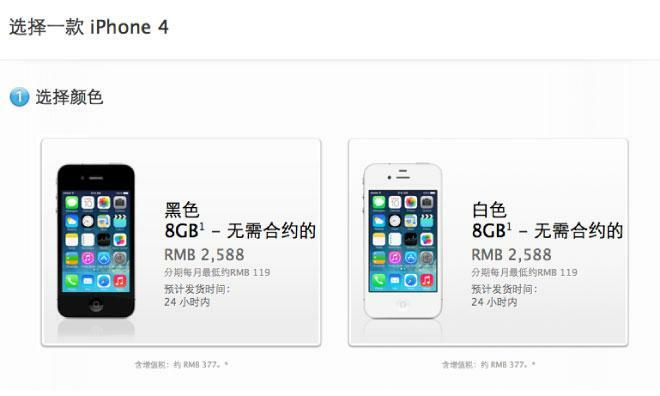 Apple's mainland China online store continues to offer the iPhone 4 for delivery within 24 hours. In an unconventional move for the company, Apple has chosen to keep the three-year-old iPhone 4 on mainland Chinese shelves even after the unveiling of the new flagship iPhone 5s and mid-tier iPhone 5c. While China is not alone as a first-party country where the iPhone 4 is still sold  Brazil and Indonesia also offer it  it is the only nation to list the iPhone 4 alongside the iPhone 5c and 5s. The aging handset remains available through Apple's official online and brick-and-mortar stores for 2,588 yuan ($423), 700 yuan ($114) less than the iPhone 4S and 1,900 yuan ($310) and 2,700 yuan ($441) less than the newly-introduced iPhone 5c and 5s, respectively. Apple also continues to offer installment plans for the iPhone 4, advertising payments of "about 119" yuan ($19) per month over 24 months. Similarly, iPhone 4 launch carrier partner China Unicom still markets the device for 2,648 yuan ($433), while authorized resellers like brick-and-mortar retail giant Suning and online behemoth jd.com make the iPhone 4 available at varying, but roughly equivalent, prices. While speculation exists that Apple has kept the iPhone 4 in circulation as a way of drawing down remaining inventory, the breadth of the phone's continuing distribution and the lack of indications from official channels that supplies are constrained signals that its availability is not temporary, and may be Cupertino's way of addressing the low-cost market that many believed they would target with the iPhone 5c.